We appreciate your feedback about your support experience with Lucas Stark, developers of WooCommerce Conditional Content. This helps us maintain high standards on the WooMarketplace, and helps Lucas Stark improve. 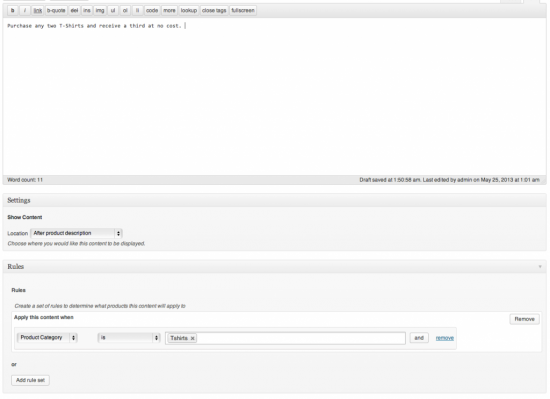 Display dynamic content throughout your store based on easy to configure rules and conditions. Display a message on products which are about to go on sale. Display a message on products which are about to go out of stock or expire. 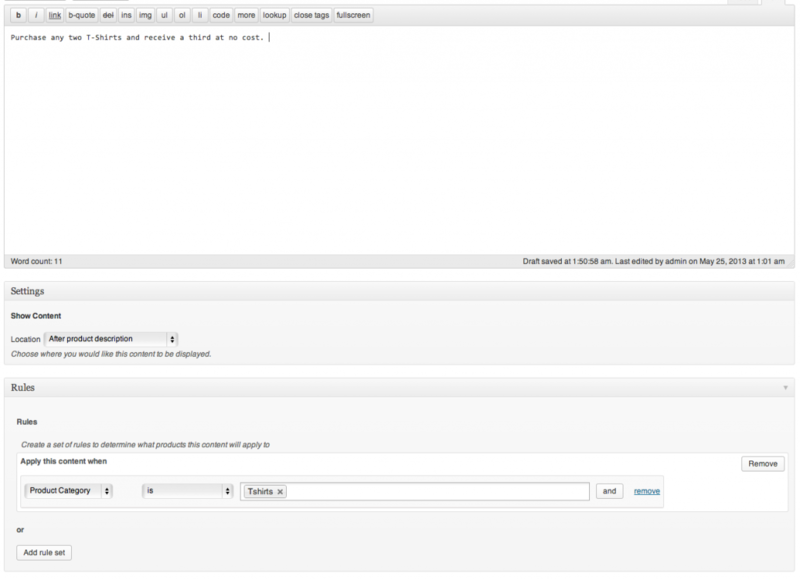 Display messages to specific users or specific user roles. Display messages on the cart when certain products are in it. Display messages on products when other items have been added to the cart. Display messages to users who have already added the product or other products from the same category to their cart. ( A great combination to your hat are these gloves ). Display Pricing tables that correlate to Dynamic Pricing rules. Conditional content is the extension you need to provide a dynamic, customer tailored experience to your shoppers. At the heart of the extension is a detailed rule builder that can be used to construct conditions to control where and when content will display on your store. 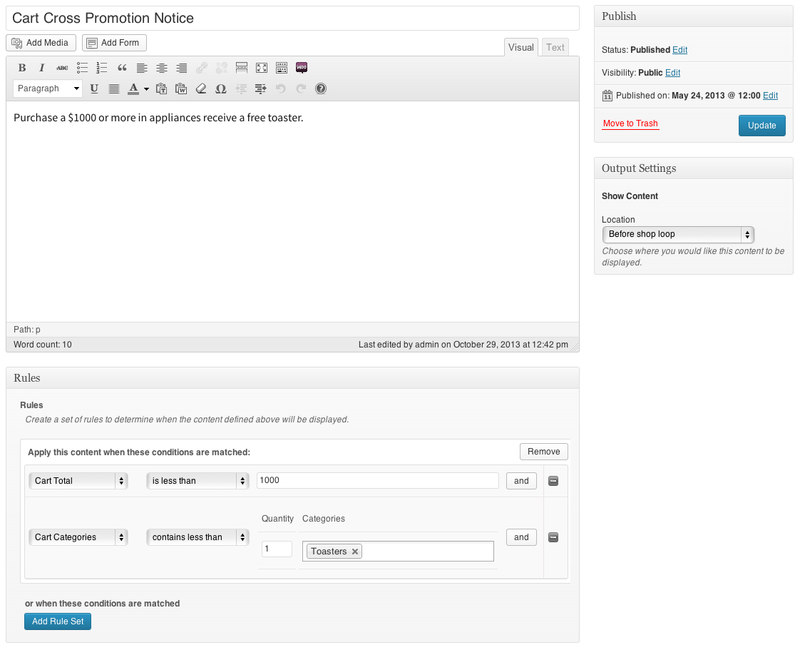 The rule builder allows you to build conditions for very simple and quick messages, such as a sale on a product category, to very detailed messages involving dozens of pre-defined criteria you can select from. In addition to providing an easy to use rule builder, a long list of predefined locations is available for you to select from. All the hooks from WooCommerce are available to select from. This allows you to quickly get your content on your site without having to know what all the available filters in WooCommerce are, and where they would actually display the content. For use cases when you need to output the content somewhere not in the predefined list, you can manually enter the filter or use a template tag in your theme directly. Have you ever needed to display content on all items in your store that are in a particular category? The category rule allows you to do this in no time. Want promote a sale or purchases on a a product about to run out of stock? Use the stock level rule to prompt shoppers to act fast. Conditional Content has a wide selection of rules that can be combined to create powerful conditional content displays through your store. Single Product Output Rules for outputting your content on individual products. Specific Products – Choose what products this content should show up on. Product Types – Choose to display the content on all products which are of a particular type. 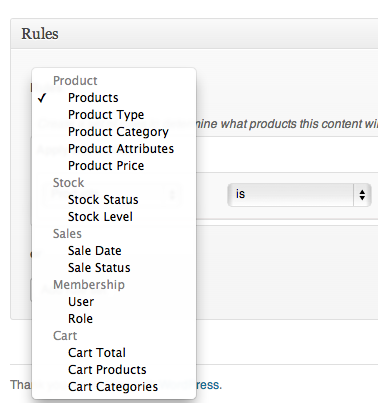 Product in Categories – Choose to display the content on all products in a particular set of categories. Products with Attributes – Display the content on products that have specific attributes. Product Price Range – Content will display on products that are in this price range. Stock Status – Display the content on products that are in or out of stock. Stock Level Range – Display the content on products which have inventory in a particular range. Sale Start and End dates – Display the content when the product is on sale between these dates. Sale Status – Display when the product is or is not on sale. General Output Rules – These rules can be used to further filter Single Product rules, or to define rules that show up else where on the site. Since these rules do not rely on product specific data, they can be used to configure content to show up anywhere on your store. 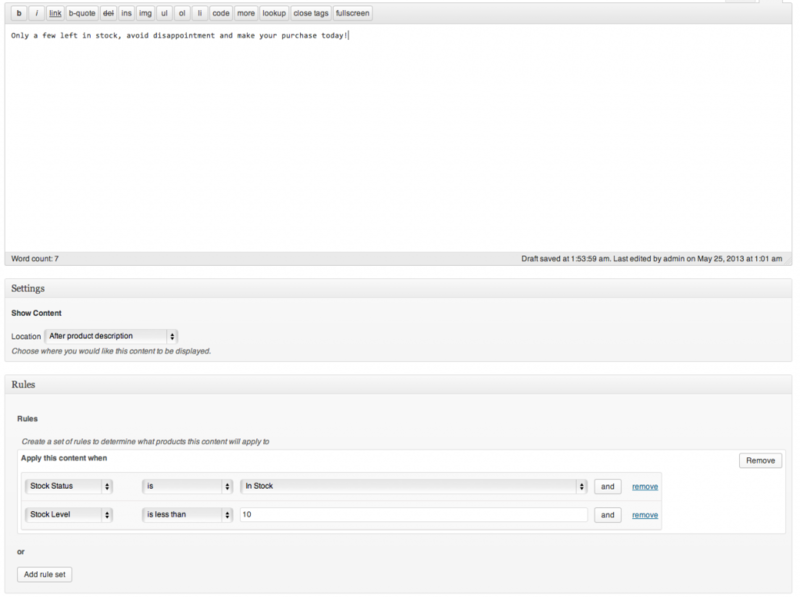 Specific Roles – Display the content to specific user roles. 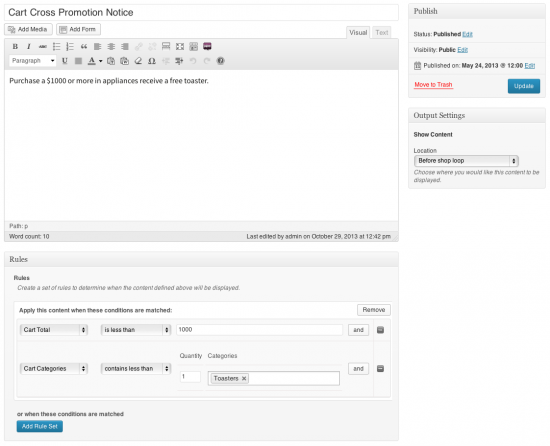 Specific Users – Display the content to specific users. Cart Total – Display the message when the cart total is more or less than a particular value. Cart Products – Display the message when particular products are in the cart, at a specific quantity level.. Categories of Products in Cart – Display the message when products from categories are in the cart, at a specific quantity level. Conditional Content is also the perfect companion extension to Dynamic Pricing. With conditional content, you can configure a set of rules that match your pricing structure. Great for displaying your complex advanced Dynamic Pricing rules on specific products or throughout your store. Since conditional content gives you the ability to display content on products when certain quantities of items are added to the cart, it’s a great way to let users know about a discount they can receive if they purchase more products.